An object on a hyperbolic trajectory through the inner solar system was discovered by the Pan-STARRS survey on 19 October 2017 and given a cometary designation C/2017 U1 (PANSTARRS). It was subsequently identified in images from 14 October by the Catalina Sky Survey. On 25 October it was assigned an asteroidal designation A/2017 U1 based on the lack of observed cometary activity. On 6 November the Minor Planet Center assigned it the designation 1I as the first object in a new designation scheme for interstellar objects, and they also announced approval of the name 'Oumuamua suggested by the Pan-STARRS team. 34 days (2017 Oct 14--Nov 17), 121 obs. 80 days (2017 Oct 14-2018 Jan 02), 207 obs. The MPC's initial automated calculations of the orbit of 2017 U1 assumed the orbit was elliptical or parabolic, resulting in the rejection of multiple reported observations. Not until 22 October was the orbit successfully identified as highly hyperbolic with an orbital eccentricity of 1.188 ± 0.016, exceeding the highest previously determined eccentricity for a solar system object. The eccentricity was later revised to 1.19951 ± 0.00018. The figure below shows eccentricity vs. perihelion distance for 3,987 solar system comets (those known through December 2017) plus 'Oumuamua, showing it to be an outlier. If there were no influence from the gravitation of the planets, a comet arriving in the inner solar system from the Oort cloud would appear to have a nearly parabolic orbit, i.e. an orbital eccentricity of 1.000. The gravity of the planets (mostly Jupiter) will perturb a comet's orbit during passage through the inner solar system, often producing a slightly hyperbolic orbit. For example, a simplistic treatment implies that a comet with an eccentricity of 1.000 when beyond the jovian planets could have an heliocentric eccentricity of ~1.0027 in the inner solar system. Full modeling of the influence of the planets and non-gravitational effects (outgassing from the comet) shows case-by-case results may be larger. For 6,248 comets observed through December 2017, 347 had measured orbital eccentricities larger than 1.000. Only 53 had eccentricities larger than 1.0027, the largest for C/1980 E1 Bowell with e=1.057. The SSDP group has tracked the dynamics of hyperbolic comets observed through 2012. For 34 comets with eccentricity greater than 1.0027, all but two were clearly bound to the solar system before passing through the inner solar system with e<1.000. The remaining two had pre-encounter eccentricities of ~1.0001--this difference from parabolic is comparable to estimated errors and equates to a velocity of only ~0.1 km/s when previously distant from the Sun. However, 18 of these comets were clearly unbound on their exit from the solar system, with hyperbolic eccentricities. In the case of C/1980 E1 Bowell, it passed 0.228 AU from Jupiter before perihelion which resulted in its being ejected from the solar system with what will be a final velocity relative to the Sun of 3.8 km/s (currently, in Dec. 2017, it is 64 AU from the Sun receeding at 6 km/s). The table below summarizes data for the 10 highest eccentricity objects observed. The figure below shows, for 496 hyperbolic and near-parabolic comets, the change in velocity resulting from passage through the inner solar system versus the original (pre-passage) velocity. Velocities are relative to the Sun and computed for 250 AU before and after passage. The sharp cutoff for pre-encounter velocities at ~2.9 km/s argues that all of these objects were bound to the solar system (within error bars). Many of these objects (likely over 100) were perturbed sufficient during passage through the planetary region that they became unbound. 'Oumuamua, however, was clearly never bound as its velocity relative to the Sun is far greater than what could result from a planetary encounter. In early 2018 discovery was reported of two hyperbolic asteroids, A/2017 U7 and A/2018 C2 (JPL, 2018). These objects are only slightly hyperbolic (eccentricities of 1.00148 and 1.00177, respectively); both were bound to the solar system prior to entering the planetary region. A/2018 C2 will be marginally bound after departing the planetary region. While it initially appeared that A/2017 U7 would be slightly unbound, it was later reported that it will still be bound [Hui, 2018]. A/2017 U7 will not cross within the orbit of Jupiter, reaching perihelion in Sept. 2019 at 6.4 AU, while A/2018 C2 will pass 1.96 AU from the Sun in June 2018. 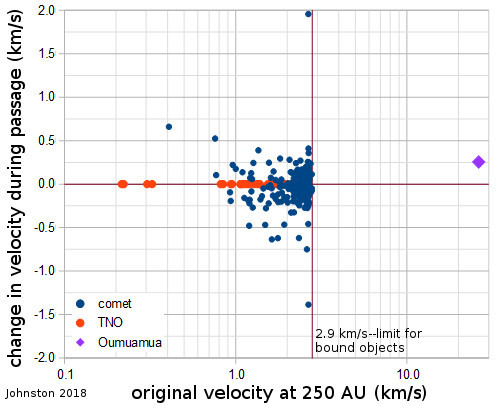 Both objects have orbits typical of comets, and 2018 C2 later showed cometary activity [Hui, 2018]. For an albedo of 0.04, these objects would be 50 km and 6 km in size, respectively. In 2018 Namouni and Morais (2018) concluded that asteroid (514107) 2015 BZ509 was of interstellar origin based on integration of its orbit over long integration time periods. 2015 BZ509 is coorbital with Jupiter but with a retrograde orbit--semimajor axis of 5.140 AU, eccentricity of 0.3807, and inclination of 163.0°. The conclusion is based on finding that the current orbit is stable for multi-billion year timescales combined with the understanding that "planet formation models cannot produce such a primordial large inclination orbit." Currently, interstellar origin of (514107) 2015 BZ509 is at least in part model dependent. 'Oumuamua's pre-encounter velocity with respect to the solar system was 26.1 km/s, arriving roughly from the direction of Vega. Its outgoing direction will be in the constellation Pegasus at a final velocity of 26.4 km/s. 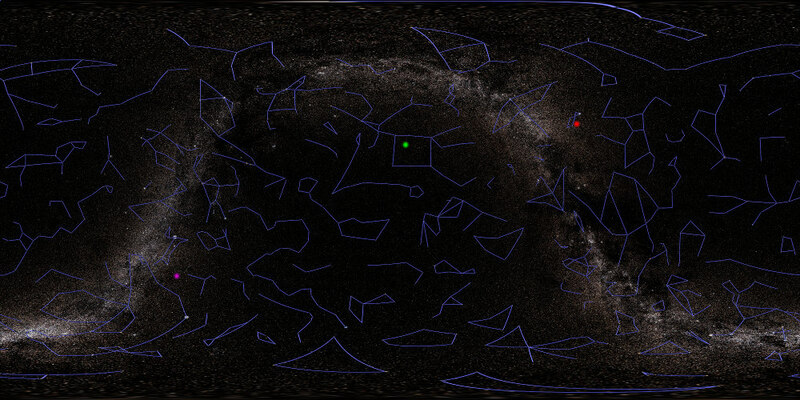 The sky map below shows the direction 'Oumuamua arrived from on the right (green dot), its original direction prior to encountering the solar system on the left (magenta dot), and its final outbound direction after encountering the solar system in the center (green dot). The space velocity of 'Oumuamua is similar to the local standard of rest, hinting that it could have been ejected from a relatively young local system. Modeling of the past dynamics of 'Oumuamua, however, does not suggest a particular neighboring system as its origin, since any identifiable past encounters are at velocities too high to suggest ejection. For example, Portegies Zwart et al. (2017) identify an encounter 1.3 Myr ago at a distance of 0.52 light years from TYC4742-1027-1 (a ~K-type star currently 440 light years from the Sun) but at a relative velocity of 103 km/s. Alternately, Dybczynski and Krolikowska (2017) identify low velocity encounters but at large distances, e.g. one with UCAC4 535-065571 at 5.2 km/s 2.1 million years ago but at a distance of 4.65 light years. They also identify a pass 0.14 light years from HIP 3757 118,000 years ago with a relative velocity of 185 km/s. Note that all of these encounter estimates are dependent on the accuracy of our knowledge of local stellar motions and distances as well as accuracy of 'Oumuamua's past trajectory. 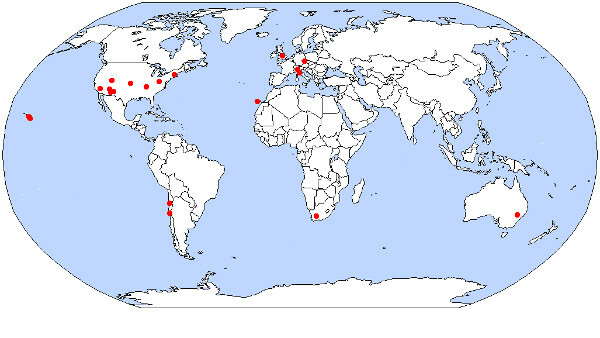 The map below shows the locations of facilities (red dots) that have observed 'Oumuamua. Observing time was also obtained on both the Hubble Space Telescope and the Spitzer Space Telescope in late November (NASA, 2017), and additional time on the Hubble Space Telescope in December and January. Astrometric results from the Hubble Space Telescope observations helped constrain 'Oumuamua's orbit (Micheli et al., 2018). No results have yet been reported from the Spizter observations--this is unsurprising as these data would take longer to analyze, though it could also result from a failure to detect 'Oumuamua. Observations from the Canada-France-Hawaii Telescope on 22 October of 'Oumuamua when the object was about 1.25 AU from the Sun showed no cometary coma, with similar subsequent results from other telescopes (Meech et al., 2017). Using these results to set an upper limit on dust production gives a limit of 1.7 grams/sec, 7-8 orders of magnitude less than typical long-period comets (Meech et al., 2017). Meech et al. (2017) also report "The immediate area surrounding the object was searched for faint companions with similar motion but none were found." Fitzsimmons et al. (2017) suggest based on thermal modeling that ices in the interior of the object could have been sufficiently insulated during the object's perihelion passage to not produce outgassing, though this conclusion only permits (does not require) the possibility of a cometary composition given certain assumptions. Somewhat contradictory conclusions have been reported regarding 'Oumuamua's color. Observations generally indicate it is reddish, but not as red as trans-Neptunian objects. 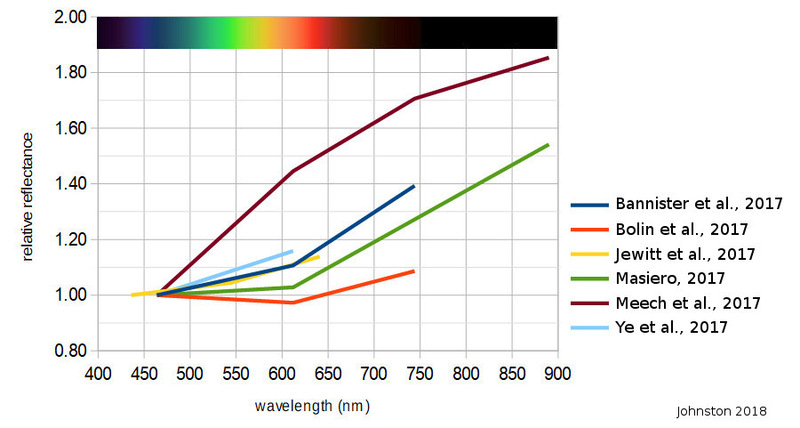 Reported colors in standard channels are summarized below; these results vary by about 50% in spectral slope (i.e., "redness" of spectra). The table and figure below summarize these results. Fraser et al. (2017) and Fitzsimmons et al. (2017) suggest that the varying results can be explained by the rotational tumbling if one region of 'Oumuamua is redder than the remaining surface. Fitzsimmons et al. (2017) report higher resolution spectra, finding that the colors are more consistent with Jupiter trojan asteroids than with typical outer solar system objects. Within the limitations of their spectra resolution, they found no specific absorption features attributable to ices or rocky minerals. Observations of 'Oumuamua's rotational lightcurve showed it to have a very extreme lightcurve variation, implying a highly elogated shape. Reported lightcurve results are summarized in the table below (derived values in brackets). Several of the published results are for partial rotation observations only, so they only set a lower bound to the magnitude variation. Fraser et al. (2017) suggest that the Meech et al. (2017) could overestimate the true lightcurve amplitude as these observations were at a non-zero phase angle. Alternately, any observations that were not viewing from the plane perpendicular to 'Oumuamua's rotation axis could underestimate the true maximum lightcurve amplitude. Thus it is plausible to conclude that 'Oumuamua's axial ratio (a/c) is between 5:1 and 10:1. The inconsistency of the rotation period results is noteworthy, and in fact is irreconcilable unless the object is tumbling as concluded by Fraser et al. (2017) and Drahus et al. (2017). 'Oumuamua is not resolved in any telescopic observations, so estimates of its size depend on assumptions of albedo. If its albedo is assumed to be similar to small bodies in our solar system with similar colors, then an albedo of 0.04-0.1 is implied. Sizes and dimensions for 'Oumuamua for different assumed values of albedo and axial ratio are given in the table below. The 1:7 to 1:10 axial ratio implied by 'Oumuamua's lightcurve is an extreme outlier among solar system objects. Of 18,462 asteroids with observed lightcurves, only a few show lightcurve variations this extreme. The asteroids with the most extreme lightcurve variations are listed in the following table (lightcurve data from Warner et al., 2017). The figure below shows the axial ratio implied by lightcurves variations for all asteroids with measured lightcurves (lightcurve and diameter data from Warner et al., 2017). This assumes observed lightcurve variations are due to irregular shape and not due to brightness variations on the surface. For many of the objects larger than 400 km in diameter, such brightness variations are more important than non-spherical shape in producing lightcurve variations. The red region shows where 'Oumuamua would be placed. While axial ratios as extreme as 'Oumuamua are very rare among all asteroids, they are slightly less rare for objects in the size range estimated for 'Oumuamua. The table below lists information on asteroids with measured lightcurves implying axial ratios of 5:1 or greater and with measured or estimated diameters from 55 to 450 m (lightcurve data from Warner et al., 2017; diameter data from multiple sources or estimated based on an albedo of 0.16). PHA indicates potentially hazardous asteroid. These 10 asteroids are among 528 with measured lightcurves in this size range, i.e. 1.9% of those in this size range have lightcurves implying at least a 5:1 axial ratio. The following four figures are based on data from Warner et al. (2017). The first figure shows the cumulative fraction of solar system objects with apparent axial ratios exceeding a given value (assuming axial ratio is the sole factor in observed lightcurve variations). "Anthropogenic items" refers to man-made objects orbiting the Sun, mostly space probes or spent rocket upper stages. The next figure shows histograms of percentage of asteroids in various size ranges as a function of apparent axial ratios. Asteroids larger than 100 km tend to have low axial ratios as they are large enough for self-gravitation to force a shape in hydrostatic equilibrium. 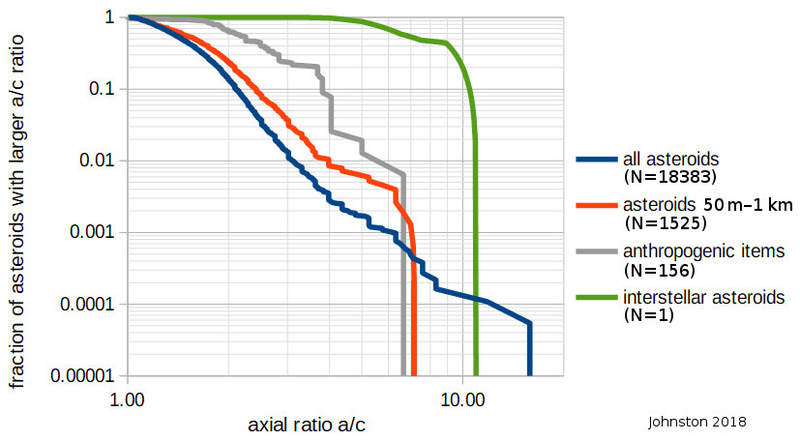 Extreme shapes are more common at smaller sizes, but axial ratios more extreme than 1:5 remain uncommon. As most smaller objects are either collisional fragments or rubble piles, this is consistent with expectations that extreme shapes are hard to produce as either fragments or rubble piles. The figure below shows the fraction of asteroids as a function of diameter and apparent axial ratios. Percentages are within each diameter bin; each bin includes about 1,000 asteroids with the exception of the three largest and three smallest size bins which have smaller samples. The black box indicates the size and axial ratio ranges estimated for 'Oumuamua. For asteroids the size of 'Oumuamua, of order 1% have axial ratios of 5:1 or greater; none have axial ratios greater than 8:1. The figure below shows apparent axial ratio vs. apparent size for asteroids smaller than 1 km in diamter and for ~150 manmade objects in solar orbit (axial ratios for manmade objects are illustrative, as their lightcurves are more complex). The red region shows the best estimates for 'Oumuamua. The apparent lack of volatiles is surprising because most planetary system debris ejected into interstellar space is expected to be cometary material. This is because (1) stellar elemental abundances imply that most planetesimal debris is icy/volatile and (2) cometary material would tend to reside at greater distances from the central star(s) and hence be easier to become gravitationally unbound. However, this is in the context of existing assumptions regarding planetary system formation. Jackson et al. (2017) suggest that binary star systems may eject as much or more rocky planetesimals as icy ones. Collisional fragments--as unitary fragments of the collisional breakup of a larger body, small fragments may have irregular shapes. Extreme axial ratios are less likely, however, for homogeneous compositions. Durda et al. (2015) examined shapes of fragments from high velocity impacts with basalt targets and found few fragments with more extreme axial ratios than 1:3 (among experimental results shown, one fragment of over 100 had a ratio between 5:1 and 10:1). Michikami et al. (2016) in a similar study obtained similar results, with nearly all of 12,700 fragments having axial ratios of 5:1 or less and with 0.1-1% in experimental results shown having ratios between 5:1 and 10:1. This is consistent with fractions based on imaging analysis of boulders on the asteroid (25143) Itokawa by Michikami et al. (2010): they found of order 1% of 343 measured boulders had axial ratios between 5:1 and 10:1, with these boulders ranging in size from 0.1 to 150 m. However, the extreme axial ratios were less common with larger boulders. Rubble piles--these are unconsolidated bodies of fragments and dust sustained by self-gravitation, with less effective internal strength than unitary fragements. Elongated objects may result from rapid rotation, but such objects will tend to fission and/or spin off material with faster rotation, rather than attain extreme axial ratios. For fluid bodies (with no internal strength), sufficiently rapid rotation can produce dumbbell or contact binary shapes, but 3:1 is extreme for this process (Descamps, 2015). Limited internal strength in the form of interactions between component particles in a rubble pile may permit more extreme shapes (just as sand in a pile will exhibit an angle of repose in contrast to fluid behavior). Tanga et al. (2009) simulated rubble pile shapes and found axial ratios of 5:1 are feasible, though uncommon. Binaries--close binaries in mutual orbit will exibit lightcurve variations implying large axial ratios (2-3 to 1). More extreme apparent axial ratios require the bodies themselves to have extreme shapes, again unlikely for fluid (strengthless) bodies (Descamps, 2015). It would also require the two components to have similar sizes, in order for the secondary to contribute significantly to the light curve. Of known binary asteroids in 'Oumuamua's size range, only 7% have similar sizes, with the secondary-to-primary size ratio ranging from 5-50% for the remaining 93% (Johnston, 2017). Residual shapes from low velocity planetesimal accretion--irregular shapes of some comets are hypothesized to be artifacts of the original accretion of the bodies. This has been proposed to account for the contact binary shape of comet 67P/Churyumov-Gerasimenko. However, for this process to dominate over settling into a rubble pile the collision velocity must be extremely slow. In addition, this process is unlikely to be able to build an objects with an axial ratio as extreme as that of 'Oumuamua. Collisional reshaping--non-disruptive impacts will reshape target bodies whether coherent (unitary collisional fragments) or unconsolidated (rubble piles). This process is more likely to reduce rather than increase the fraction of objects with the most extreme axial ratios, however. Szabo and Kiss (2008) suggest that older asteroid families, exposed to longer periods of impacts, have fewer members with the most extreme shapes. Domokos et al. (2017) propose collisional abrasion by very small particles (relative to the target body) as a process that can produce extreme shapes. This process requires that all colliding particles be small relative to the target, however; i.e. the size distribution of particles must be significantly different from those observed (either among asteroids/comets or in fragmentation experiments). This in turn would require a process for sorting particle sizes. The fact that 'Oumuamua is tumbling strongly suggests it is a rigid body with high internal strength, as a body with low internal strength (a rubble pile) would rapidly dampen any tumbling via internal reconfiguration until it settles in a single principal axis rotation state (Fraser et al., 2017). The alternate explanation is that 'Oumuamua was recently perturbed into tumbling rotation, though this seems unlikely given that it appears to have been travelling in interstellar space for a long time. The surface inhomogeniety (local reddening) postulated for 'Oumuamua (Fraser et al., 2017) contradicts the lack of differentiation expected for small bodies (and is also a rare feature for small asteroids in our solar system). Taken with the extreme shape that suggests the possibility of internal strength that is not uniform in all directions, one explanation could be that 'Oumuamua is a fragment of a planetary-class object. This has been suggested by Cuk (2017), Hansen and Zuckerman (2017), and Jackson et al. (2017), who discuss various possibilities involving tidal disruption of a planet followed by ejection from the system of origin of some of the resulting fragments. The SETI project observed 'Oumuamua for possible radio emissions in November and December using the Allen Telescope Array and the Green Bank Telescope; results were negative (Beatty, 2017; Enriquez et al., 2018; Harp et al., 2018; Tingya et al., 2018). It would be extremely difficult and expensive to send a robotic spaceprobe at sufficient speed to catch up with 'Oumuamua--but not impossible given current technology (Hein et al., 2017). A proposal has been submitted for use of the Spitzer Space Telescope to observe any future interstellar asteroids (Trilling et al., 2018). Hibberg, Adam, Andreas M. Hein, and T. Marshall Eubanks, (13 Feb 2019), Project Lyra: Catching 1I/'Oumuamua--mission opportunities after 2024, arXiv, on line, 1902.04935. Moro-Martin, Amaya, (11 Feb. 2019), Could 1I/'Oumuamua be an icy fractal aggregate ejected from a protoplanetary disk? A fluffy radiation-pressure-driven scenario, Astrophysical Journal Letteres, forthcoming; arXiv, on line, 1902.04100. Sekanina, Zdenek, (25 Jan. 2019), 1I/'Oumuamua as debris of dwarf interstellar comet that disintegrated before perihelion, arXiv, on line, 1901.08704. Siraj, Amir, and Abraham Loeb, 18 Jan. 2019, 'Oumuamua's geometry could be more extreme than previously inferred, Research Notes of the AAS, 3(1):15. Hands, Thomas Oliver, Walter Dehnen, Amery Gration, Joachim Stadel, and Ben Moore, (8 Jan. 2019), The fate of planetesimal discs in young open clusters: implications for 1I/'Oumuamua, the Kuiper belt, the Oort cloud and more, submitted to Monthly Notices of the Royal Astronomical Society; arXiv, on line, 1901.02465. Forbes, John C., and Abraham Loeb, (2 Jan. 2019), Turning up the heat on 'Oumuamua, submitted to Astrophysical Journal Letters; arXiv, on line, 1901.00508. Vavilov, Dmitrii E., and Yurii D. Medvedev, 5 Jan. 2019 (29 Dec. 2018), Dust bombardment can explain the extremely elongated shape of 1I/'Oumuamua and the lack of interstellar objects, Monthly Notices of the Royal Astronomical Society, 484(1):L75; arXiv, on line, 1812.11334. Siraj, Amir, and Abraham Loeb, 11 Feb. 2019 (23 Nov. 2018), Identifying interstellar objects trapped in the solar system through their orbital parameters, Astrophysical Journal Letters, 872(1):L10; arXiv, on line, 1811.09632. Moro-Martin, Amaya, 1 Feb. 2019 (31 Oct. 2018), Origin of 1I/'Oumuamua. II. An ejected exo-Oort cloud object?, Astronomical Journal, 157(2):86; arXiv, on line, 1811.00023. Bialy, Shmuel, and Abraham Loeb, 12 Nov. 2018 (30 Oct. 2018), Could solar radiation pressure explain 'Oumuamua's peculiar acceleration?, Astrophysical Journal Letters, 868(1):L1; arXiv, on line, 1810.11490. Trilling, David E., Michael Mommert, Joseph L. Hora, Davide Farnocchia, Paul Chodas, Jon Giorgini, Howard A. Smith, Sean Carey, Carey M. Lisse, Michael Werner, Andrew McNeill, Steven R. Chesley, Joshua P. Emery, Giovanni Fazio, Yanga R. Fernandez, Alan Harris, Massimo Marengo, Michael Mueller, Alissa Roegge, Nathan Smith, H. A. Weaver, Karen Meech, and Marco Micheli, 14 Nov. 2018 (21 Oct. 2018), Spizter observations of interstellar object 1I/'Oumuamua, Astronomical Journal, 156(6):261; arXiv, on line, 1811.08072. Ashton, Edward, Brett Gladman, J. Kavelaars, and Gareth Williams, 21 Oct. 2018, Interstellar interlopers in the outer solar system, DPS #50, 201.02. Bolin, Bryce, Rory Barnes, Thomas Quinn, and Alessandro Morbidelli, 21 Oct. 2018, The galactic orbit of 1I/2017 U1 `Oumuamua, DPS #50, 301.06D. Drahus, Michal, Piotr Guzik, Waclaw Waniak, Barbara Handzlik, Sebastian Kurowski, and Siyi Xu, 21 Oct. 2018, Detailed photometric characterization of 'Oumuamua with Gemini North, DPS #50, 301.02. Guzik, Piotr, and Michal Drahus, 21 Oct. 2018, 1I/`Oumuamua--Probably too small to ever be an active comet, DPS #50, 301.05. Handzlik, Barbara, Sebastian Kurowski, Waclaw Waniak, Michal Drahus, Piotr Guzik, and Siyi Xu, 21 Oct. 2018, Spectral variability of 1I/'Oumuamua, DPS #50, 301.03. Meech, Karen, Michael J. Belton, Marc W. Buie, Kenneth C. Chambers, Davide Farnocchia, Olivier Hainaut, Robert Jedicke, Jacqueline V. Keane, Jan T. Kleyna, Eugene Magnier, Marco Micheli, Beatrice E. Mueller, Dina Prialnik, Norbert Schorghofer, Richard J. Wainscoat, Harold A. Weaver, and Robert Weryk, 21 Oct. 2018, Discovery, characterization and origin of interstellar object 'Oumuamua, DPS #50, 301.01. Miller, Bryan, Andy Adamson, Andrew Stephens, and Arturo Nunez, 21 Oct. 2018, Gemini operations for non-sidereal target science, DPS #50, 119.05. Ramanjooloo, Yudish, Richard J. Wainscoat, Robert Weryk, Kenneth C. Chambers, and Eugene A. Magnier, 21 Oct. 2018, The Pan-STARRS search for near-Earth objects, DPS #50, 304.08. Trilling, David, Andrew McNeill, Michael Mommert, Joseph Hora, Davide Farnocchia, Paul Chodas, Jon Giorgini, Howard Smith, Sean Carey, Carey M. Lisse, Michael Werner, Steve Chesley, Joshua Emery, Giovanni Fazio, Yanga Fernandez, Alan Harris, Massimo Marengo, Michael Mueller, Alissa Roegge, Nathan Smith, Harold A. Weaver, Karen Meech, and Marco Micheli, 21 Oct. 2018, Spitzer observations of `Oumuamua and `Oumuamua's density and shape, DPS #50, 301.04. Lingam, M., and A. Loeb, 12 Oct. 2018, Implications of captured interstellar objects for panspermia and extraterrestrial life, Astronomical Journal, 156:193. Moro-Martin, Amaya, 22 Oct. 2018 (5 Oct. 2018), Origin of 1I/'Oumuamua. I. An ejected protoplanetary disk object?, Astrophysical Journal, 866:131; arXiv, on line, 1810.02148. Bailer-Jones, C. A. L., D. Farnocchia, K. J. Meech, R. Brasser, M. Micheli, S. Chakrabarti, M. W. Buie, and O. R. Hainaut, 18 Oct. 2018 (24 Sept. 2018), Plausible home stars of the interstellar object 'Oumuamua found in Gaia DR2, Astrophysical Journal, 156:205; arXiv, on line, 1809.09009. Rafikov, Roman R., 31 Oct. 2018 (20 Sept. 2018), Spin evolution and cometary interpretation of the interstellar minor object 1I/2017 'Oumuamua, Astrophysical Journal Letters, 867(1):L17; arXiv, on line, 1809.06389. Guzik, Piotr, and Michal Drahus, 16 Sept. 2018, 1I/'Oumuamua--probably too small to ever be an active comet, EPSC, 12:EPSC2018-1103, on line [https://meetingorganizer.copernicus.org/EPSC2018/EPSC2018-1103.pdf]. Harp, G. R., Jon Richards, Peter Jenniskens, Seth Shostak, J. C. Tartar, 10 Nov. 2018 (28 Aug. 2018), Radio SETI observations of the interstellar object 'Oumuamua, Acta Astronautica, 155:51-54; arXiv, on line, 1808.09355. Almeida-Fernandes, F., and H. J. Rocha-Pinto, 14 Aug. 2018 (10 Aug. 2018), A kinematical age for the interstellar object 1I/'Oumuamua, Monthly Notices of the Royal Astronomical Society, 480(4):4903-4911; arXiv, on line, 1808.03637.
Cooper, John, Natasha Papitashvili, and Steven Sturner, 14 July 2018, Proton spectral radiation environment of the outer heliosphere and local interstellar medium, 42nd COSPAR, PIR.1-26-18. Marceta, Dusan, and Miljan Kolcic, 14 July 2018, Probability for close look at interstellar objects, 42nd COSPAR, B1.3-37-18. Micheli, Marco, Davide Farnocchia, Karen J. Meech, Marc W. Buie, Oliver R. Hainaut, Dina Prialnik, Norbert Schorghofer, Harold A. Weaver, Paul W. Chodas, Jan T. Kleyna, Robert Weryk, Richard J. Wainscoat, Harald Ebeling, Jacqueline V. Keane, Kenneth C. Chambers, Detlef Koschny, and Anastassios E. Petropoulos, 12 July 2018, Non-gravitational acceleration in the trajectory of 1I/2017 U1 ('Oumuamua), Nature, 559:223-226. McDonnell, Tony, and Simon F. Green, April 2018, Interstellar matter; influx and efflux to and from the solar system, 20th EGU General Assembly, p. 9350. Grishin, Evgeni, Hagai B. Perets, and Yael Avni, (25 April 2018), Planet seeding and lithopanspermia through gas-assisted capture of interstellar objects, arXiv, on line, 1804.09716. Tanikawa, Ataru, Takeru K. Suzuki, and Yasuo Doi, (23 April 2018), Metal pollution of low-mass population III stars through accretion of interstellar objects like 'Oumuamua, Publications of the Astronomical Society of Japan, forthcoming; arXiv, on line, 1804.08200. Kwiecinski, James A., Andrew L. Krause, and Robert A. Van Gorder, 4 April 2018, Effects of tidal torques on 1I/2017 U1 ('Oumuamua), Icarus, 311:170-174. Belton, M. J. S., O. R. Hainaut, K. J. Meech B. E. A. Mueller, J. T. Kleyna, H. A. Weaver, M. W. Buie, M. Drahus, P. Guzik, R. J. Wainscoat, W. Waniak, B. Handzlik, S. Kurowski, S. Xu, S. S. Sheppard, M. Micheli, H. Ebeling, and J. V. Keane, 1 April 2018, The excited spin state of 1I/2017 U1 'Oumuamua, Astrophysical Journal Letters, 856:L21; arXiv, on line, 1804.03471. McNeill, Andrew, David E. Trilling, and Michael Mommert, 10 April 2018 (27 March 2018), Constraints on the density and internal strength of 1I/'Oumuamua, Astrophysical Journal Letters, 857:L1; arXiv, on line, 1803.09864. Park, Ryan S., D. J. Pisano, T. Joseph W. Lazio, Paul W. Chodas, and Shantanu P. Naidu, 10 April 2018 (27 March 2018), Search for OH 18-cm radio emission from 1I/2017 U1 with the Green Bank Telescope, Astronomical Journal, 155:185; arXiv, on line, 1803.10187. Seligman, Darryl, and Gregory Laughlin, 30 April 2018 (19 March 2018), The feasibility and benefits of in situ exploration of 'Oumuamua-like objects, Astronomical Journal, 155:217; arXiv, on line, 1803.07022. Supplementary material at https://dseligman.github.io/. Raymond, Sean N., Philip J. Armitage, and Dimitri Veras, 20 March 2018 (7 March 2018), Interstellar object 'Oumuamua as an extinct fragment of an ejected cometary planetesimal, Astrophysical Journal Letters, 856:L7; arXiv, on line, 1803.02840. Wickramasinghe, N. Chandra, Edward J. Steele, Daryl H. Wallis, Robert Temple, Gensuke Tokoro, and Janaki T. Wickramasinghe, Feb. 2018, Oumuamua (A/2017 U1)--A confirmation of links between galactic planetary systems, Advances in Astrophysics, 3(1):43-46, on line [http://www.isaacpub.com/images/PaperPDF/AdAp_100095_2018010413584759958.pdf]. Tingay, S. J., D. L. Kaplan, E. Lenc, S. Croft, B. McKinley, A. Beardsley, B. Crosse, D. Emrich, T. M. O. Franzen, and B. M. Gaensler, 9 April 2018 (27 Feb. 2018), A serendipitous MWA search for narrow-band signals from 'Oumuamua, Astrophysical Journal, 857(1):11; arXiv, on line, 1802.09276. Katz, J. I., 3 May 2018 (7 Feb. 2018), Why is interstellar object 1I/2017 U1 ('Oumuamua) rocky, tumbling and very prolate?, Monthly Notices of the Royal Astronomical Society, 478(1):L95-L98; arXiv, on line, 1802.02273. Hoang, Theim, Abraham Loeb, A. Lazarian, and Jungyeon Cho, 11 June 2018 (5 Feb. 2018), Spinup and disruption of interstellar asteroids by mechanical torques, and implications for 1I/2017 U1 ('Oumuamua), Astrophysical Journal, 860(1):42; arXiv, on line, 1802.01335.
de la Fuente Marcos, Carlos, Raul de la Fuente Marcos, and Sverre J. Aarseth, 6 Feb. 2018 (2 Feb. 2018), Where the solar system meets the solar neighborhood: Patterns in the distribution of radiants of observed hyperbolic minor bodies, Monthly Notices of the Royal Astronomical Society, 476(1):L1-L5; arXiv, on line, 1802.00778. Do, Aaron, Michael A. Tucker, and John Tonry, 1 March 2018 (10 Jan. 2018), Interstellar interlopers: Number density and origins of 'Oumuamua-like objects, Astrophysical Journal Letters, 855:L10; arXiv, on line, 1801.02821. Enriquez, J. E., A. Siemion, T. J. W. Lazio, M. Lebofsky, D. H. E. MacMahon, R. S. Park, S. Croft, D. DeBoer, N. Gizani, V. Gajjar, G. Hellbourg, H. Isaacson, and D. C. Price, 15 Jan. 2018 (10 Jan. 2018), Breakthrough Listen observations of 1I/'Oumuamua with the GBT, Research Notes of the American Astronomical Society, 2(1):9; arXiv, on line, 1801.02814. Rafikov, Roman R., 28 June 2018 (10 Jan. 2018), 1I/2017 'Oumuamua-like interstellar asteroids as possible messengers from dead stars, Astrophysical Journal, 861(1):35; arXiv, on line, 1801.02658. Zhang, Qicheng, 3 Jan. 2018 (21 Dec. 2017), Prospects for backtracking 1I/'Oumuamua and future interstellar objects, Astrophysical Journal Letters, 852(1):L13; arXiv, on line, 1712.08059. Gaidos, Eric, 27 April 2018 (19 Dec. 2017), What and whence 1I/'Oumuamua: A contact binary from the debris of a young planetary system?, Monthly Notices of the Royal Astronomical Society; 477(4):5692-5699; arXiv, on line, 1712.06721. Hansen, Brad, and Ben Zuckerman, 29 Dec. 2017 (19 Dec. 2017), Ejection of material--"Jurads"--from post main sequence planetary systems, Research Notes of the American Astronomical Society, 1(1):55; arXiv, on line, 1712.07247. Fitzsimmons, Alan, Colin Snodgrass, Ben Rozitis, Bin Yang, Mcabh Hyland, Tom Seccull, Michele T. Bannister, Wesley C. Fraser, Robert Jedicke, and Pedro Lacerda, 18 Dec. 2017 (18 Dec. 2017), Spectroscopy and thermal modeling of the first interstellar object 1I/2017 U1 'Oumuamua, Nature Astronomy, 2:133-137; arXiv, on line, 1712.06552. Wright, Jason T., 7 Dec. 2017 (17 Dec. 2017), On distinguishing interstellar objects like 'Oumuamua from products of solar system scattering, Research Notes of the American Astronomical Society, 1(1):38; arXiv, on line, 1712.06044. Domokos, Gabor, Andras A. Sipos, Gyula M. Szabo, and Peter L. Varkonyi, 15 Dec. 2017 (12 Dec. 2017), Explaining the elongated shape of 'Oumuamua by the Eikonal abrasion model, Research Notes of the American Astronomical Society, 1(1):50; arXiv, on line, 1712.04409. Jackson, Alan P., Daniel Tamayo, Noah Hammond, Mohamad Ali-Dib, and Hanno Rein, 19 March 2018 (12 Dec. 2017), Ejection of rocky and icy material from binary star systems: Implications for the origin and composition of 1I/`Oumuamua, Monthly Notices of the Royal Astronomical Society, 478(1):L49-L53; arXiv, on line, 1712.04435. Cuk, Matija, 4 Jan. 2018 (6 Dec. 2017), 1I/'Oumuamua as a tidal disruption fragment from a binary star system, Astrophysical Journal Letters, 852(1):L15; arXiv, on line, 1712.01823. Drahus, M., P. Guzik, W. Waniak, B. Handzlik, S. Kurowski, and S. Xu, 1 May 2018 (1 Dec. 2017), Tumbling motion of 1I/'Oumuamua and its implications for the body's distant past, Nature Astronomy, 2:407-412; arXiv, on line, 1712.00437. Fraser, Wesley C., Petr Pravec, Alan Fitzsimmons, Pedro Lacerda, Michele T. Bannister, Colin Snodgrass, and Igor Smolic, 9 Feb. 2018 (30 Nov. 2017), The tumbling rotational state of 1I/'Oumuamua, Nature Astronomy, 2:383-386; 1I/'Oumuamua is tumbling, arXiv, on line, 1711.11530. Zuluaga, Jorge I. Oscar Sanchez-Herandez, Mario Sucequia, and Ignacio Ferrin, 14 May 2018 (28 Nov. 2017), A general method for assessing the origin of interstellar small bodies: The case of 1I/2017 U1 (Oumuamua), Astronomical Journal, 155:236; arXiv, on line, 1711.09397. Raymond, Sean N., Philip J. Armitage, Dimitri Veras, Elisa V. Quintana, and Thomas Barclay, 26 Feb. 2018 (27 Nov. 2017), Implications of the interstellar object 1I/'Oumuamua for planetary dynamics and planetesimal formation, Monthly Notices of the Royal Astronomical Society, 476:3031-3038; arXiv, on line, 1711.09599. Feng, Fabo, and Hugh R. A. Jones, 9 Jan. 2018 (23 Nov. 2017), 'Oumuamua as a messenger from the Local Association, Astrophysical Journal Letters, 852(2):L27; arXiv, on line, 1711.08800. Dybczynski, Piotr A., and Malgorzata Krolikowska, Feb. 2018 (20 Nov. 2017), Investigating the dynamical history of the interstellar object 'Oumuamua, Astronomy and Astrophysics, 610:L11; arXiv, on line, 1711.06618. Ferrin, Ignacio, and Jorge Zuluaga, (20 Nov. 2017), 1I/2017 U1 (Oumuamua) might be a cometary nucleus, arXiv, on line, 1711.07535. Meech, Karen J., Robert Weryk, Marco Micheli, Jan T. Kleyna, Olivier R. Hainaut, Robert Jedicke, Richard J. Wainscoat, Kenneth C. Chambers, Jacqueline V. Keane, Andreea Petric, Larry Denneau, Eugene Magnier, Travis Berger, Mark E. Huber, Heather Flewelling, Chris Waters, Eva Schunova-Lilly, and Serge Chastel, 21 Dec. 2017 (20 Nov. 2017), A brief visit from a red and extremely elongated interstellar asteroid, Nature, 552:378-381, doi:10.1038/nature25020. Bannister, Michele T., Megan E. Schwamb, Wesley C. Fraser, Michael Marsset, Alan Fitzsimmons, Susan D. Benecchi, Pedro Lacerda, Rosemary E. Pike, J. J. Kavelaars, Adam B. Smith, Sunny O. Stewart, Shiang-Yu Wang, and Matthew J. Lehner, 20 Dec. 2017 (17 Nov. 2017), Col-OSSOS: Colors of the interstellar planetesimal 1I/'Oumuamua, Astrophysical Journal Letters, 851:L38; arXiv, on line, 1711.06214. Jewitt, David, Jane Luu, Jayadev Rajagopal, Ralf Kotulla, Susan Ridgway, Wilson Liu, and Thomas Augusteijn, 1 Dec. 2017 (15 Nov. 2017), Interstellar interloper 1I/2017 U1: Observations from the NOT and WIYN telescopes, Astrophysical Journal Letters, 850:L36; arXiv, on line, 1711.05687. Schneider, Jean, 20 Nov. 2017 (15 Nov. 2017), Is 1I/2017 U1 really of interstellar origin?, Research Notes of the American Astronomical Society, 1(1):18; arXiv, on line, 1711.05735. Bolin, Bryce T., Harold A. Weaver, Yanga R. Fernandez, Carey M. Lisse, Daniela Huppenkothen, R. Lynne Jones, Mario Juric, Joachim Moeyens, Charles A. Schambeau, Colin T. Slater, Zeljko Ivezic, and Andrew J. Connolly, 22 Dec. 2017 (14 Nov. 2017), APO time resolved color photometry of highly-elongated interstellar object 1I/'Oumuamua, Astrophysical Journal Letters, 852(1):L2; arXiv, on line, 1711.04927. Cyncynates, David, Emanuela Dimastrogiovanni, Saurabh Kumar, Jagjit Sidhu, and Glenn D. Starkman, (12 Nov. 2017), Could 1I/'Oumuamua be macroscopic dark matter?, arXiv, on line, 1711.04348. Portegies Zwart, Simon, Inti Pelupessy, Jeroen Bedorf, Maxwell X. Cai, and Santiago Torres, 18 May 2018 (9 Nov. 2017), The origin of interstellar asteroidal objects like 1I/2017 U1, Monthly Notices of the Royal Astronomical Society, 479(1):L17-L22; arXiv, on line, 1711.03558. Trilling, David E., Tyler Robinson, Alissa Roegge, Colin Orion Chandler, Nathan Smith, Mark Loeffler, Chad Trujillo, Samuel Navarro-Meza, and Lori M. Glaspie, 1 Dec. 2017 (9 Nov. 2017), Implications for planetary system formation from interstellar object 1I/2017 U1 ('Oumuamua), Astrophysical Journal Letters, 850:L38; arXiv, on line, 1711.01344. Hein, Andreas M., Nikolaos Perakis, Kelvin F. Long, Adam Crowl, Marshall Eubanks, Robert G. Kennedy III, and Richard Osborne, (8 Nov. 2017), Project Lyra: Sending a spacecraft to 1I/'Oumuamua (former A/2017 U1), the interstellar asteroid, arXiv, on line, 1711.03155. Laughlin, Gregory, and Konstantin Batygin, 12 Dec. 2017 (7 Nov. 2017), On the consequences of the detection of an interstellar asteroid, Research Notes of the American Astronomical Society, 1(1):43; arXiv, on line, 1711.02260. Ye, Quan-Zhi, Qicheng Zhang, Michael S. P. Kelley, and Peter G. Brown, 5 Dec. 2017 (7 Nov. 2017), 1I/2017 U1 ('Oumuamua) is hot: Imaging, spectroscopy and search of meteor activity, Astrophysical Journal Letters, 851:L5; arXiv, on line, 1711.02320. Gaidos, Eric, Jonathan P. Williams, and Adam Kraus, 8 Nov. 2017 (3 Nov. 2017), Origin of interstellar object A/2017 U1 in a nearby young stellar association, Research Notes of the American Astronomical Society, 1(1):13; arXiv, on line, 1711.01300. Knight, Matthew M., Silvia Protopapa, Michael S. P. Kelley, Tony L. Farnham, James M. Bauer, Dennis Bodewits, Lori M. Feaga, and Jessica M. Sunshine, 30 Dec. 2017 (2 Nov. 2017), On the rotation period and shape of the hyperbolic asteroid 1I/'Oumuamua (2017 U1) from its lightcurve, Astrophysical Journal Letters, 851:L31; arXiv, on line, 1711.01402. Masiero, Joseph R., (2 Nov. 2017), Palomar optical spectrum of hyperbolic near-Earth object A/2017 U1, arXiv, on line, 1710.09977.
de la Fuente Marcos, Carlos, and Raul de la Fuente Marcos, 1 Nov. 2017 (1 Nov. 2017), Pole, pericenter and nodes of the interstellar minor body A/2017 U1, Research Notes of the American Astronomical Society, 1(1):5//9; arXiv, on line, 1711.00445. Mamajek, Eric, 23 Nov. 2017 (31 Oct. 2017), Kinematics of the interstellar vagabond A/2017 U1, Research Notes of the American Astronomical Society, 1(1):21; arXiv, on line, 1710.11364. Moro-Martin, Amaya, (31 Oct. 2018), Origin of 1I/'Oumuamua. II. An ejected exo-Oort cloud object?, arXiv, on line, 1811.00023. Exoplanet.eu, 2019, Planet Oumuamua, Exoplanet.eu, on line [http://exoplanet.eu/catalog/oumuamua/]. Gilster, Paul, 15 Jan. 2019, 'Oumuamua: Future study of interstellar objects, Centauri Dreams, on line [https://www.centauri-dreams.org/2019/01/15/oumuamua-future-study-of-interstellar-objects/]. Loeb, Abraham, 20 Nov. 2018 (21 Nov. 2018), 6 strange facts about interstellar visitor 'Oumuamua, Scientific American: Observations, on line [https://blogs.scientificamerican.com/observations/6-strange-facts-about-the-interstellar-visitor-oumuamua/]; arXiv, on line, 1811.08832. Gilster, Paul, 15 Nov. 2018, Spitzer size constraints on 'Oumuamua, Centauri Dreams, on line [https://www.centauri-dreams.org/2018/11/15/spitzer-size-constraints-on-oumuamua/]. Kohler, Susanna, 7 Nov. 2018, Revisiting interstellar asteroid 'Oumuamua, AAS Nova, on line [https://aasnova.org/2018/11/07/revisiting-interstellar-asteroid-oumuamua/]. Gilster, Paul, 29 Oct. 2018, 'Oumuamua, thin films and lightsails, Centauri Dreams, on line [https://www.centauri-dreams.org/2018/10/29/on-oumuamua-thin-films-and-lightsails/]. Trilling, David E., et al., 19 Oct. 2018, 'Oumuamua, SAO, on line [https://www.cfa.harvard.edu/news/su201842]. Hainaut, Oliver R., Karen J. Meech, Marco Micheli, Michael S. J. Belton, et al., Sept. 2018, Rendezvous with 'Oumuamua, The Messenger, 173:13, on line [https://www.eso.org/sci/publications/messenger/archive/no.173-sep18/messenger-no173-13-16.pdf]. Gilster, Paul, 25 Sept. 2018, 'Oumuamua's origin: A work in progress, Centauri Dreams, on line [https://www.centauri-dreams.org/2018/09/25/oumuamuas-origin-a-work-in-progress/]. Gilster, Paul, 27 June 2018, 'Oumuamua: New data point to a comet, Centauri Dreams, on line [https://www.centauri-dreams.org/2018/06/27/oumuamua-new-data-point-to-a-comet/]. Micheli, Marco, Karen Meech, Olivier Hainaut, and Mathias Jager, 27 June 2018, Hubble sees 'Oumuamua getting a boost: New results indicate interstellar nomad is a comet, Hubble Space Telescope, on line [https://www.spacetelescope.org/news/heic1813/]. Micheli, Marco, Olivier Hainaut, Davide Farnocchia, Detlef Koschny, Markus Bauer, 27 June 2018, Interstellar asteroid is really a comet, ESA, on line [https://m.esa.int/Our_Activities/Space_Science/Interstellar_asteroid_is_really_a_comet]. Trilling, David, Joseph Hora, Michael Mommert, Davide Farnocchia, Steve Chesley, Joshua Emery, Giovanni Fazio, Alan Harris, Migo Mueller, and Howard Smith, May 2018, ToO observations of a newly discovered interstellar ('Oumuamua-like) object, Spitzer Proposal #14003 [ADS abstract]. Snodgrass, Colin, 23 April 2018, It came from outer space: Interstellar visitor 1I/'Oumuamua, ING, on line [http://www.ing.iac.es/astronomy/science/Colin_Snodgrass_ING_2018.pdf]. Ragozzine, Darin, April 2018, On the detectability of interstellar objects like 1I/'Oumuamua, DDA meeting #49, 301.05 [ADS abstract]. Seligman, Darryl, and Gregory Laughlin, April 2018, The feasibility and benefits of in situ exploration of `Oumuamua-like objects, DDA meeting #49, 301.02 [ADS abstract]. Ye, Quan-Zhi, April 2018, Telescopic and meteor observation of `Oumuamua, the first known interstellar asteroid, DDA meeting #49, 301.03 [ADS abstract]. Gilster, Paul, 21 March 2018, Mission to an interstellar asteroid, Centauri Dreams, on line [https://www.centauri-dreams.org/2018/03/21/mission-to-an-interstellar-asteroid/]. Gilster, Paul, 20 March 2018, A binary origin for 'Oumuamua?, Centauri Dreams, on line [https://www.centauri-dreams.org/2018/03/20/a-binary-origin-for-oumuamua/]. O'Neill, Ian, winter 2018, The interstellar visitor, Mercury, 47(1), on line [https://www.astrosociety.org/membership/email/sample_content/mercury_sample1.pdf]. Redd, Nola Taylor, 22 Feb. 2018, 1st known interstellar visitor is tumbling out of control: How astronomers know, Space.com, on line [https://www.space.com/39767-first-interstellar-visitor-oumuamua-tumbling.html]. Gilster, Paul, 14 Feb. 2018, 'Oumuamua: New work on interstellar objects, Centauri Dreams, on line [https://www.centauri-dreams.org/2018/02/14/oumuamua-new-work-on-interstellar-objects/]. Sokol, Joshua, 13 Feb. 2018, Will astronomers be ready for the next 'Oumuamua?, Scientific American, on line [https://www.scientificamerican.com/article/will-astronomers-be-ready-for-the-next-lsquo-oumuamua/]. Cuk, Matija, 5 Feb. 2018, The three surprises of 'Oumuamua, Phys.org, on line [https://phys.org/news/2018-02-oumuamua.html]. Meech, Karen, 29 Jan. 2018, Ice can survive an interstellar trip, Nature Astronomy, 2:112-113. Kohler, Susanna, 19 Jan. 2018, Update on an interstellar asteroid, AAS Nova, on line [http://aasnova.org/2018/01/19/update-on-an-interstellar-asteroid/]. Bolin, Bryce T., et al., 17 Jan. 2018, Time-resolved photometry of highly elongated ISO 1I/'Oumuamua, 18th NASA SBAG Meeting, LPI, on line [https://www.lpi.usra.edu/sbag/meetings/jan2018/presentations/4-45pme_Bolin.pdf]. Meech, Karen, 17 Jan. 2018, 'Oumuamua, our solar system's first (known) interstellar visitor, 18th NASA SBAG Meeting, LPI, on line [https://www.lpi.usra.edu/sbag/meetings/jan2018/presentations/10-35am_Meech.pdf]. Beatty, Kelly, 19 Dec. 2017, 'Oumuamua: Red, tumbling, and silent, Sky and Telescope, on line [http://www.skyandtelescope.com/astronomy-news/solar-system/oumuamua-red-tumbling-and-silent/]. Shostak, Seth, 18 Dec. 2017, Is this mysterious space rock actually an alien spaceship?, SETI Institute, on line [https://www.seti.org/node/3406]. Breakthrough Initiatives, 13 Dec. 2017, Breakthrough Listen releases initial results and data from observations of 'Oumuamua, Breakthrough Initiatives, on line [https://breakthroughinitiatives.org/news/15]. Breakthrough Initiatives, 11 Dec. 2017, Breakthrough Listen to observe interstellar object 'Oumuamua, Breakthrough Initiatives, on line [https://breakthroughinitiatives.org/news/14]. Yoshida, Seiichi, 23 Nov. 2017, 1I/'Oumuamua, Seiichi Yoshida's Home Page, on line [http://aerith.net/comet/catalog/0001I/2017U1.html]. Gilster, Paul, 22 Nov. 2017, 'Oumuamua: Listening to an interstellar interloper, Centauri Dreams, on line [https://www.centauri-dreams.org/2017/11/22/oumuamua-listening-to-an-interstellar-interloper/]. Gilster, Paul, 21 Nov. 2017, Unusual visitor: A deeper look at 'Oumuamua, Centauri Dreams, on line [https://www.centauri-dreams.org/2017/11/21/unusual-visitor-a-deeper-look-at-oumuamua/]. ESO, 20 Nov. 2017, ESO observations show first interstellar asteroid is like nothing seen before, ESO, on line [http://www.eso.org/public/news/eso1737/]. Gemini Observatory, 20 Nov. 2017, First Known Interstellar Visitor is an "Oddball", Gemini Observatory, on line [https://www.gemini.edu/node/12729]. Institute for Astronomy, 20 Nov. 2017, Earth's first known interstellar visitor unmasked, Institute for Astronomy, University of Hawaii, on line [http://www.ifa.hawaii.edu/info/press-releases/Oumuamua/]. NASA, 20 Nov. 2017, Solar system's first interstellar visitor dazzles scientists, NASA, on line [https://www.nasa.gov/feature/solar-system-s-first-interstellar-visitor-dazzles-scientists]. Talbert, Tricia, ed., 20 Nov. 2017, Interstellar asteroid FAQs, NASA, on line [https://www.nasa.gov/planetarydefense/faq/interstellar]. Gilster, Paul, 10 Nov. 2017, Project Lyra: Sending a spacecraft to 1I/'Oumuamua (formerly A/2017 U1), the interstellar asteriod, Centauri Dreams, on line [https://www.centauri-dreams.org/2017/11/10/project-lyra-sending-a-spacecraft-to-1ioumuamua-formerly-a2017-u1-the-interstellar-asteroid/]. Croswell, Ken, 31 Oct. 2017, Astronomers race to leran from first interstellar asteroid ever seen, Nature News, on line [https://www.nature.com/news/astronomers-race-to-learn-from-first-interstellar-asteroid-ever-seen-1.22925]. MPC, 25 Oct. 2017, Comet C/2017 U1 (PANSTARRS), MPEC 2017-U181. MPC, 25 Oct. 2017, A/2017 U1, MPEC 2017-U183. MPC, 26 Oct. 2017, A/2017 U1, MPEC 2017-U185. MPC, 27 Oct. 2017, A/2017 U1, MPEC 2017-U234. MPC, 29 Oct. 2017, A/2017 U1, MPEC 2017-U263. MPC, 29 Oct. 2017, A/2017 U1, MPEC 2017-U265. MPC, 29 Oct. 2017, Minor planets 2017 SN33 and 2017 U1, CBET 4450. MPC, 1 Nov. 2017, A/2017 U1, MPEC 2017-V01. MPC, 6 Nov. 2017, New designation scheme for interstellar objects, MPEC 2017-V17. MPC, 10 Nov. 2017, 1I/'Oumuamua, MPEC 2017-V38. MPC, 13 Nov. 2017, 1I/'Oumuamua, MPEC 2017-V62. MPC, 13 Nov. 2017, 1I/'Oumuamua, MPEC 2017-V63. MPC, 20 Nov. 2017, 1I/'Oumuamua, MPEC 2017-W75. Cibulkova, H., H. Nortunen, J. Durech, M. Kaasalainen, P. Veres, R. Jedicke, R. J. Wainscoat, M. Mommert, D. E. Trilling, E. Schunova-Lilly, E. A. Magnier, C. Waters, and H. Flewelling, 2018, Distribution of shape elongations of main belt asteroids derived from Pan-STARRS1 photometry, Astronomy and Astrophysics, 611:A86. Descamps, Pascal, 2015, Dumb-bell-shaped equilibrium figures for fiducial contact-binary asteroids and EKBOs, Icarus, 245:64-79; arXiv, on line, 1410.7962. Durda, Daniel D., Adriano Campo Bagatin, Rafael A. Aleman, George J. Flynn, Melissa M. Strait, Angela N. Clayton, and Emma B. Patmore, 2015, The shapes of fragments from catastrophic disruption events: Effects of target shape and impact speed, Planetary and Space Science, 107:77-83. Hui, Man-To, 2018, Two hyperbolic baldheads in the solar system: 2017 U7 and 2018 C2, Astronomical Journal, 156:73. Johnston, W. R., 2017a, Binary Minor Planets Compilation V10.0, NASA Planetary Data System, urn:nasa:pds:ast_binary_parameters_compilation, on line [https://sbn.psi.edu/pds/resource/binmp.html]. Johnston, W. R., 25 March 2017, Asteroid albedos: graphs of data, Johnston's Archive, on line [http://www.johnstonsarchive.net/astro/astalbedo.html]. Johnston, W. R., 22 July 2018, Asteroids with satellites, Johnston's Archive, on line [http://www.johnstonsarchive.net/astro/asteroidmoons.html]. Johnston, W. R., 28 March 2015, Comets: graphs of orbital data, Johnston's Archive, on line [http://www.johnstonsarchive.net/astro/cometsgraph.html]. Johnston, W. R., 7 Feb. 2018, Deep space probes and other manmade objects beyond near Earth orbit, Johnston's Archive, on line [http://www.johnstonsarchive.net/astro/awrjp493.html]. Johnston, W. R., 25 March 2018, TNO/Centaur diameters, albedos, and densities, Johnston's Archive, on line [http://www.johnstonsarchive.net/astro/tnodiam.html]. JPL, 2017, 2018, JPL Small-Body Database Browser, JPL, on line [https://ssd.jpl.nasa.gov/sbdb.cgi]. Korycansky, D. G., and Erik Asphaug, 2003, Impact evolution of asteroid shapes. 1. Random mass redistribution, Icarus, 163:374-388. Krolikowska, Malgorzata, and Piotr A. Dybczynski, 2017, Oort spike comets with large perihelion distances, Monthly Notices of the Royal Astronomical Society, 472:4634-4658; arXiv, on line, 1708.09248. Krolikowska, M., G. Sitarski, E. M. Pittich, S. Szutowicz, K. Ziolkowski, H. Rickman, R. Gabryszewski, and B. Rickman, 2014, New catalogue of one-apparition comets discovered in the years 1901–1950. I. Comets from the Oort spike, Astron. & Astrophys., 571:A63. 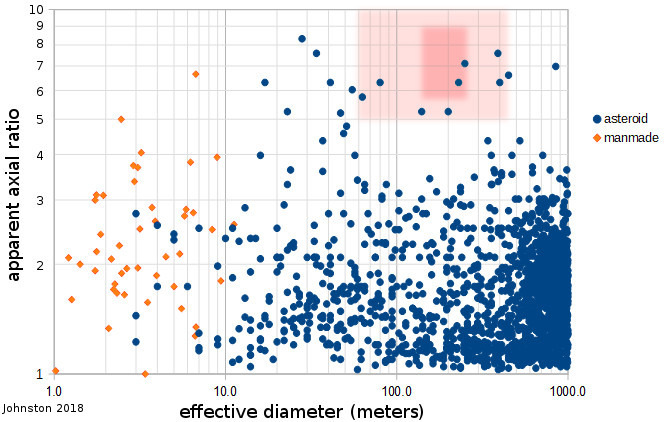 Michikami, Tatsuhiro, Akiko M. Nakamura, and Naru Hirata, 2010, The shape distribution of boulders on asteroid 25143 Itokawa: Comparison with fragments from impact experiments, Icarus, 207:277-284. Michikami, Tatsuhiro, Axel Hagermann, Tokiyuki Kadokawa, Akifumi Yoshida, Akira Shimada, Sunao Hasegawa, and Akira Tsuchiyama, 2016, Fragment shapes in impact experiments ranging from cratering to catastrophic disruption, Icarus, 264:316-330. Moro-Martin, Amaya, Edwin L. Turner, and Abraham Loeb, 2009, Will the Large Synoptic Survey Telescope detect extra-solar planetesimals entering the solar system?, Astrophysical Journal, 704(1):733; arXiv, on line, 0908.3948. MPC, 4 March 2018, A/2017 U7, MPEC 2018-E17. MPC, 4 March 2018, A/2018 C2, MPEC 2018-E18. Namouni, F., and M. H. M. Morais, 21 May 2018 (23 May 2018), An interstellar origin for Jupiter's retrograde co-orbital asteroid, Monthly Notices of the Royal Astronomical Society, 477(1):L117-L121; arXiv, on line, 1805.09013. NASA/Goddard Space Flight Center Scientific Visualization Studio, 2009, The Tycho Catalog Skymap--Version 2.0, NASA, on line [https://svs.gsfc.nasa.gov/3572]. Sekanina, Zdenek, 1976, A probability of encounter with interstellar comets and the likelihood of their existence, Icarus, 27:123-133. Solar System Dynamics and Planetology Group, Space Research Centre, Polish Academy of Sciences, 2013, "The Catalogue of Near-Parabolic Comets," on line [http://ssdp.cbk.waw.pl/LPCs/near_parabolic_comets_catalogue.html]. Szabo, Gyula M., and Laszlo L. Kiss, 2008, The shape distribution of asteroid families: Evidence for evolution driven by small impacts, Icarus, 196:135-143; arXiv, on line, 0801.2389. Tanga, P., C. Omito, P. Paolicchi, D. Hestroffer, A. Cellino, A. Dell'Oro, D. C. Richardson, K. J. Walsh, and M. Delbo, 2009, Rubble-pile reshaping reproduces overall asteroid shapes, Astrophysical Journal, 706:L197-L202. Warner, B. D., A. W. Harris, and P. Pravec, 2009, The asteroid lightcurve database, Icarus, 202:134-146. Warner, B. D., A. W. Harris, and P. Pravec, 12 Nov. 2017, Asteroid Lightcurve Database, on line [http://www.MinorPlanet.info/lightcurvedatabase.html]. Last modified 17 February 2019.